Americas gateway to the universe. Leading the world in preparing and launching missions to Earth and beyond. June 18, 2004John F. Kennedy Space Center Spaceport Newshttp://www-pao.ksc.nasa.gov/kscpao/snews/snewstoc.htm Vol. 43, No. 13(See FIRES, Page 2) County, Palm Bay residents very thankful for saving propertyBy Linda Herridge Staff WriterWhen wildfires in the Palm Bay and Malabar area threatened homes and property during the Memorial Day holiday weekend, a team of Kennedy Space Center and 45th Space Wing firefighters rushed to the area to help. The firefighters teamed up with task forces from Satellite Beach, Malabar, Melbourne, Palm Bay, Patrick Air Force Base and Brevard County already on site to help put out heavy flames near the 45th Space Wing resources at the Malabar Site near Palm Bay and Malabar Roads. Under a mutual aid agreement with the Palm Bay Fire Department, KSC firefighters provide fire protection coverage.KSC FIREFIGHTERS Lt. Keith Abell (left) and Chris Maupin stow gear in the aircraft firefighting vehicle used to combat recent wildfires in south Brevard County.Spaceport firefighters fight flames in south BrevardFirefighter Chris Maupin, Lt. Keith Abell and driver Von Thorne helped put out fires working from 3:30 p.m. to well into the evening, answering the call of duty on the national holiday. Maupin said the smoke was so thick he could not see more than a foot in front of him. According to Abell, the timing of their arrival was good. We were able to get in behind a portion of the fire and put it out before it reached any of the houses. The effort was well coordinated, and the teamwork between our crew and the cities went smoothly. Jim Farmer, KSC firefighters operations chief, said the neighbors in the affected area were grateful for the assistance from the Spaceport. The neighbors appreciated that we had our aircraft firefighting vehicles at the site, said Farmer. The trucks carry large quantities of water and have a long reach for putting out fires, Maupin and Abell added that they received a lot of thumbs up and cheers from the residents. On June 1, several firefighters returned to the area to check the ground and make sure it was wet enough to prevent fires from reigniting. Firefighter Michael Herndon, who worked on June 1, was satisfied with the groups efforts. We protected lives and property in a safe manner. Farmer added: One of KSCs values is safety and health. It isSpace Gateway Support Information Management (IM) employees have been shipping care packages to military troops in Iraq and Afghanistan since April. If you know of a friend or relative serving abroad and want to include them in this project, contact IM secretary Joy Antonucci via e-mail or at 8677660. To learn more about the program and to view criteria, visit www.anysoldier.US or view the IM home page. The IM Mail and Special Services Department is playing a major role in the project by picking up bagged or boxed items at mail stops and transporting them to the IM Directors office for repacking and shipping to the troops. Items being shipped include basic food, personal hygiene items, entertainment media and even small stuffed animals for the troops to pass out to local children. Some of the most requested items are eye wash, AA batteries, magazines, paperback books, crossword puzzles/word search, any type of small board or card games, powdered drinks, and snacks/breakfast food/fruits/ soups that do not melt. Each box is sent to a soldier with a thank you note inside. How to say 'Thanks' to our brave military overseas SPACE GATEWAY SUPPORT employees Elaine Brabaw (right), and Joy Antonucci, pack boxes as part of Information Management's "Support Our Troops" effort. SPACEPORT NEWS Page 3 June 18, 2004Recognizing Our PeopleBy Layla Higgins NASA Public Affairs InternThirteen KSC employees were recently presented with the prestigious Silver Snoopy Award for their service to Space Shuttle astronauts. The award is a direct honor bestowed by the astronaut corps to individuals who contribute the most to the safety and success of human space flight. Employees were recognized for their outstanding contributions to flight, the exceptional manner in which they carry out their responsibilities, exceeding normal requirements and demonstrating pride in their work. Astronaut Butch Wilmore presented a Silver Snoopy to Chuck Davis of the Spaceport Services Directorate, Mary Neville of ASRC Aerospace Corporation, Paul Hollis of United Space Alliance (USA) and four employees of the Boeing Company: Ed Simpson, Christine Layne, William Voight and Julie Anderson. Astronaut Doug Hurley presented the award to four Space Gateway Support employees: Christopher Vaughn, Larry Carr, Wanda Rucker and EdwardAstronauts show appreciation with Silver SnoopyCoyle. Astronaut Bob Behnken presented to Kelvin Polk of USA and Daniel Sweety of Boeing. Boeing employee Christine Layne felt both shocked and honored as she was presented with the Silver Snoopy. Layne has worked at KSC for six years and feels the award gratifies her work at the Center. With her family and friends at her side, she was very impressed by the entire presentation. The excitement overcame me and I missed the chance to thank everyone, but this award represents the entire company, said Layne. She also noted her surprise at just how sincere and genuinely friendly the presenting astronauts were. Chuck Davis was the only civil service employee to receive the Silver Snoopy. He has been with KSC since 1989. He, too, was shocked by the surprise ceremony. Attending his presentation were his wife Kathy, son Garrett and mother Lynne, who mother made a special trip from Georgia just for the ceremony. Davis, a storable propellant engineer, said he was speechless as he received what he feels is a huge honor.CHUCK DAVIS, a NASA civil service employee, receives the Silver Snoopy at a surprise ceremony attended by his mom Lynne (in hug), wife, son Garrett (right) and NASA astronaut Doug Hurley Below, Davis' colleagues help celebrate his Silver Snoopy award. By Jennifer Wolfinger Staff Writer Although Kennedy Space Centers workforce is dedicated to generating physical phenomena, some still may shudder when trying to understand physics, the science of matter and energys properties, changes and interactions. To ease these jitters, Dr. Carlos Calle, lead scientist in KSCs Electrostatics and Surface Physics Laboratory, is offering the general reader an overview of physics through his book, Superstrings and Other Things, A Guide to Physics.Dr. Calles Guide to Physics explains basic conceptsWhile teaching a modern physics course at the University of Virginia in the early 1990s, I became aware of the lack of grasp of the basic concepts of physics, said Calle. I realized there was a need for an accurate book on physics for the general reader where the concepts would be clearly explained. The time he spent writing the book is twice the length of his five-year career at Kennedy Space Center. Though conceived prior to his NASA tenure, the publication still applies to the Center. The book includes a description of the Mars Compatibility Assessment Electrometer development by KSC and Jet Propulsion Laboratory and its (See PHYSICS, Page 7) subsequent calibration work done at KSC, said Calle. This electrometer was developed as a flight instrument for the Mars exploration mission. Current development work for exploration in our lab at KSC is in part based on this instrument. The book fulfills NASAs mission of educating the public on its activities and discoveries, Calle said. A great deal of NASAs research and develop-Dr. Carlos Calle, a KSC lead scientist, wrote "Superstrings and Other Things, A Guide to Physics." Page 4 SPACEPORT NEWS June 18, 2004 By Sean O'Keefe NASA AdministratorFormer President Ronald W. Reagans boundless optimism about America manifested itself in many ways. Among them was his energetic and unbridled support for NASAs space exploration program. Less than three months after he took the oath of office, on April 12, 1981, the Space Shuttle Columbia launched on its first mission, and after a six-year hiatus, Americans were back in space to stay. A year later, in one of our countrys most memorable Fourth of July celebrations, Pres. Reagan and First Lady Nancy Reagan greeted the Columbia STS-4 crew of Thomas Mattingly and Henry Hartsfield upon the conclusion of their successful mission at Edwards Air Force Base in California. They also watched with spectators as the newly completed Shuttle Orbiter Challenger took off on top of a modified 747 jet for the Kennedy Space Center. Pres. Reagan spoke that morning about how the Shuttles were the modern day equivalent of the Yankee Clipper ships thatFormer President Reagan's optimism e mopened new horizons for our nation. Following the initial successes of the Space Shuttle program, space policy took on a new level of national importance in the Reagan Administration. In his 1984 State of the Union Address, Pres. Reagan announced plans for a permanent human presence in space with the construction of a space station, and he tasked NASA to include the international community to be a part of a project designed for the benefit of everyone on Earth. Today, the International Space Station orbits overhead as a living testament to the optimism and visionary leadership of this great man. Of course, we all remember Pres. Reagan for his eloquent speech when we lost the Challenger and its gallant crew. During his remarks, the President reminded all of us, Sometimes when we reach for the stars, we fall short, but we must pick ourselves up again and press on despite the pain. In his emotional speech he reminded us, The future doesnt belong to the fainthearted; it belongs to the brave.COLUMBIA SPACE SHUTTLE astronauts Commander Thomas K. Mattingly (foregrounRonald Reagan and his wife, Nancy, as the astronauts begin the customary walk-arounPres. Reagan presents astronaut John Young with the Congressional Space Medal of HMedal. Astronaut Robert C. Crippen also received the Distinguished Service Medal and President's Citizens Medal. At far right, Vice Pres. George Bush looks on. "SOMETIMES WHEN WE REACH for the stars, we fall short, but we must pick ourselves up again and press on despite the pain," said Pres. Reagan at a memorial service for the Space Shuttle Challenger crew at Johnson Space Center in 1986. Page 5 SPACEPORT NEWS June 18, 2004 mbodied in NASA spirit of todaynd) and Pilot Henry W. Hartsfield salute Pres.nd inspection of the orbiter after landing. Below,Honor as well as NASAs Distinguished Service Dr. Alan Lovelace was presented with the BELOW, PRES. REAGAN jokingly asks crew members, astronauts Joe Engle and Richard Truly, if they could stop by Washington en route to their California landing site so that he might come along. Standing from left to right are: Terry J. Hart, NASA deputy administrator; Dr. Hans Mark, NASA administrator; James Beggs, JSC director; and Dr. Christopher Kraft Jr. Seated from left to right are: CAPCOM astronaut Daniel Brandenstein; Pres. Reagan; and directly above the President in the background is Eugene Kranz, JSC flight operations director. PRES. RONALD REAGAN addresses NASA employees during the Agency's 25th anniversary celebration at the National Air and Space Museum, Oct. 19, 1983. 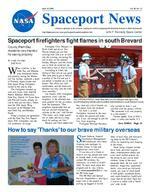 Page 6 SPACEPORT NEWS June 18, 2004By Linda Herridge Staff WriterKennedy Space Centers emergency crews firefighters, security officers and other rescue personnel are well trained to enter, evacuate, and secure unfamiliar buildings. But they never stop learning. To further increase safety at KSC, the Centers Protective Services and Safeguards Office (PSSO) is leading a state-of-theart Tactical Survey Analysis that includes photographing approximately 1 million square feet of the interior and exterior of selected facilities. The benefit for KSC is that this survey program is going to make it easier for the first responders to get in and get their jobs done easier and safer, said Gene Garcia, Tactical Survey Group project team manager. It will save lives in the long run. Two contractor organizations High Technology Solutions (HTS), Inc. of San Diego and Tactical Survey Group of Crestline, Calif. have partnered to create the first tactical surveys of critical KSC facilities. According to NASA Special Agent Roger Langevin, seven facilities were selected that represent the wide variety of facility functions found at KSC. Facility managers cooperating on this project are vital to itsNew tactical survey of KSC increases safetysuccess and have been extremely helpful, said Langevin. A team of 13 programmers and specialists, using special panoramic cameras, are shooting three-dimensional, immersive images of every square inch of the Orbiter Processing Facilities, Launch Control Center, Hazardous Maintenance Facility, Hangar AE at Cape Canaveral Air Force Station and the fourth floor of Headquarters. Aerial views of the facilities and surrounding areas are also being photographed from a helicopter. Ultimately, it is our desire to have tactical surveys for all major KSC facilities to support the management of critical incidents that could occur at any time and under various conditions, said Special Agent Calvin Burch, KSC PSSO Chief. The Tactical Survey comprises pictures of the inside of each facility including doors, windows, utility shutoff points, fire hydrant and hose locations, roof access, ingress and egress routes and alarm systems. The pictures are downloaded to a computer database for editing and formatting by High Technology Solutions specialists. Data added to the tactical survey includes important facility personnel locator information and more. HTS Project Manager Kelly Mundell and his team will edit, organize and turn hours of panoramic photographs into a program that can be viewed on a computer screen. The finished product lets the viewers feel as though they are inside the location. The first phase of the project will be delivered to KSC by August, fully encrypted for copyright and security purposes. According to Langevin, the survey team will return in July to continue photographing, editing and formatting, which could take up to eight months to complete. Working with NASA and the security team has been awesome, Mundell said. They have been supportive, very professional and eager to have this tool available for use.AERIAL VIEWS OF KSC and surrounding areas are being photographed from a helicopter to create the first tactical surveys of critical facilities.At the Spaceports first Outstanding Star ceremony earlier this month, Center Director Jim Kennedy and 45th Space Wing Commander Brig.Gen. Greg Pavlovich recognized a team of NASA, Air Force, Navy and J-BOSC personnel who recently finished a project to update the J-BOSC Statement of Work. Integrated Product Teams (IPTs), made up of Cape Canaveral Spaceport Management Office personnel, the contractor and customers, ensure that daily missions at the Spaceport flow smoothly. J-BOSC services include facility operations and maintenance, engineering services, fire, security, airfield support, laboratories, propellant and life support, information technology services, administrative services and medical and environmental support.Spaceport recognizes its shining 'Stars'MEMBERS OF THE WORK Management team are recognized for outstanding service. They include Jose Mojica (kneeling), IPT lead; Standing in the second row (from left) are KSC Director Jim Kennedy, Wayne Mendez, Jerry Jorgensen, Kim Myrick, Mike Chriswell, Sharon Cadwell, Charles Malloy and Betty Valentine. St anding in the back row are:John Storm, Chris Barbe, Ric Kowalchik, Bruce McBride, Max Farley, Cindy Bixby, Jim King and 45th Space Wing Commander Brig. Gen. Greg Pavlovich. Page 8 SPACEPORT NEWS June 18, 2004 John F. Kennedy Space Center Managing editor. . . . . . . . . . . . . . . . . . . Bruce Buckingham Editor. . . . . . . . . . . . . . . . . . . . . . . . . Jeff Stuckey Copy editor . . . . . . . . . . . . . . . . . . . Corey Schubert Editorial support provided by InDyne, Inc. Writers Group. NASA at KSC is located on the Internet at http://www.ksc.nasa.gov USGPO: 733-133/600059Spaceport News Spaceport News is an official publication of the Kennedy Space Center and is published on alternate Fridays by External Relations and Business Development in the interest of KSC civil service and contractor employees. Contributions are welcome and should be submitted two weeks before publication to the Media Services Branch, IDI-011. E-mail submissions can be sent to Jeffery.Stuckey-1@ksc.nasa.govBy Jennifer Wolfinger Staff WriterMusicians and millionaires have paid huge amounts of money to be at the heart of the Space Program, but middle school students can now Enter the Firing Room, at Kennedy Space Center whenever they want for free. A new Web site through KSC, Enter the Firing Room offers children a chance to meet real NASA experts, such as engineers and astronauts. Through video and text, participants learn about launch processing and systems. Students also can find out how to join the NASA team and learn Agency trivia. Educators have their own section with resources. Through these projects, NASA hopes to encourage students to pursue careers in science, technology, engineering and mathematics, said Berta Alfonso, an education technol-Students can now 'Enter the Firing Room'ogy project manager at KSC. Participants also learn about aeronautical heroes on the site. Astronaut James Reilly emphasizes the importance of the team that supports launches. Astronaut Janice Voss shares her experiences, including involvement in the NASA Co-op program, which led to accomplishing her dream of flying aboard the Shuttle. After visiting the site, which is operated through KSCs Education Programs and University Research Division, students test their knowledge with a quiz. Visit the Web site at http:// enterfiringroom.ksc.nasa.gov to Enter the Firing Room. Also making the most of todays technological possibilities, the Education division is developing NASAs Virtual Lab. The CD-ROMbased program provides a navigable 3-D lab environment housing a variety of scientific instruments. The Virtual Lab was created to inspire high school and entrylevel college students, in response to educators desires to access sophisticated scientific instruments. It also offers background on the available instruments and specimens. Currently available is the 3-D lab environment and the Scanning Electron Microscope instrument. More instruments and specimens are being added this year. To use these tools, download software at http:// education.ksc.nasa.gov/edtech/ vl.htm .THE TEAM of developers for the "Enter The Firing Room" Web site includes (from left) William Little, NASA Information Technology; Mark Moxley, All Points Logistics programmer; Berta Alfonso, KSC Education Technology project manager; and Gregg Buckingham, KSC University Programs.Through Labor Day on Sept. 6, all Kennedy Space Center and Cape Canaveral Air Force Station badged employees will receive one complimentary Maximum Access Admission and can purchase up to six additional Maximum Access Admissions at 50 percent off when they show their badge at the KSC Visitor Complex. Badged employees must purchase tickets in person between 9 a.m. and 5:30 p.m. at ticket windows 1-4 at the Visitor Complex. Please present your badge at time of purchase. This offer is not transferable and cannot be combined with any other discount. The Visitor Complex is open daily from 9 a.m. to approximately dusk. Maximum Access Admission includes all exhibits, Astronaut Encounter, IMAX space films, the KSC bus tour and the Astronaut Hall of Fame.Badged Spaceport employees can take free Visitor Complex tourRetired Rear Admiral Walter H. Cantrell will now help establish and lead the Agencys Independent Technical Authority (ITA) within its engineering, operations and safety organizations. Cantrell joins NASA as Deputy Chief Engineer for the ITA, effective June 7. He has served on NASAs Aerospace Safety Advisory Panel and as a member of the Stafford-Covey Task Group assessing the Agencys Return to Flight implementation efforts. One of the most difficult Columbia Accident Investigation Board organizational recommendations is that we develop an Independent Technical Authority to assure engineering excellence, said NASA Administrator Sean OKeefe. Walts role will be to guide the development and implementation process for us. Cantrell retired from the U.S. Navy in 1995 after serving as Commander, Space and Naval Warfare Systems Command.Independent Technical Authority gains new expertWALTER CANTRELL joins NASA as Deputy Chief Engineer for the Independent Technical Authority.